Modular Patch Panel and Breakout Cabling: Which to Choose for Future-Proofing Network? Coupled with emerging high-speed network standards and rapidly advancing technology, growing demand for faster access to larger volumes of data is having a profound impact on network infrastructure. As 40G becomes a standard option in data centers, the challenge of connecting 40G equipment with existing 10G equipment moves front and center. Two different types of solutions have been developed to connect 10G equipment with higher-speed equipment in the same data center: breakout cabling and modular patch panels. It is essential to understand the benefits and challenges of each type of solution in order to select the one that meets your current and future connectivity needs most effectively. So modular patch panel vs. breakout cabling: which is your choice? A breakout cable is a multi-strand cable, which is divided into multiple duplex cables. For instance, a 40G breakout cable has four individual 10G duplex cables totaling eight strands, while a 100G breakout cable has 10 duplex cables and 20 strands. A breakout cable has LC connectors at one end and an MTP/MPO connector at the other. Let’s take an example to get clear the working principle of breakout cables. Assume you want to integrate 10G servers into a 40G network. For each port on the switch, you will need a breakout cable with an MTP/MPO connector on one end and four duplex LC connectors on the other end. The MTP/MPO connector plugs into the 40G switch port and each duplex LC connector plugs into a 10G port on each server. The primary benefit of using the breakout cabling solution is that slower-speed equipment can be connected to higher-speed equipment successfully, such as the 10G servers and 40G switch. Although the breakout cables enable different speed equipment connection, they present some challenges, such as cable congestion, repair, flexibility and scalability. Breakout cables are difficult to reconfigure when you add or upgrade equipment, requiring frequent overhauls of cabling infrastructure. Not only is this approach costly and time-consuming, it limits your ability to plan properly for future growth. This is specially problematic given that future port and bandwidth growth will inevitably require integrating new network cabling standards. Modular patch panels are comprised of rack-mountable enclosures designed to house a range of modular, removable fiber cassettes. 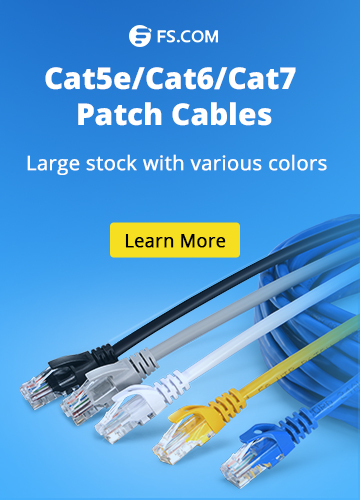 Supporting various fiber network cabling standards, the cassettes are easy to mix, match, add and replace as your connectivity needs grow and change. The fiber cassette modules are the key to this solution. 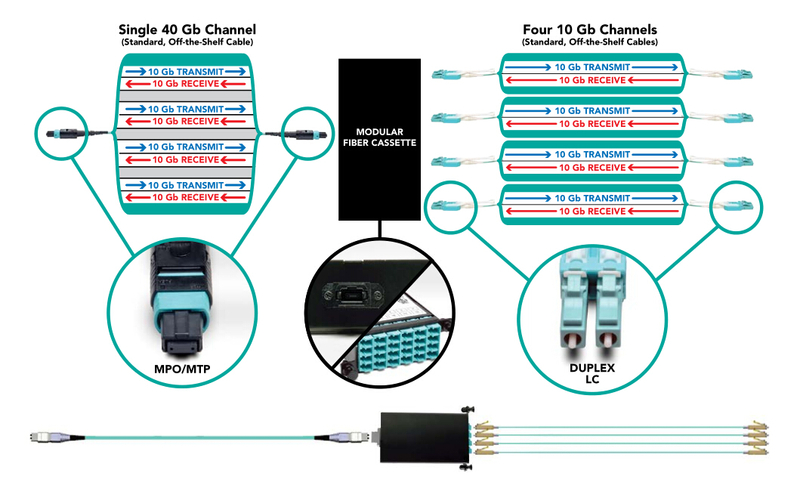 The cassettes allow users to interconnect different fiber speeds simply by plugging standard, duplex LC cables into one side of the cassette, and MTP/MPO cables into the other side. Modular patch panel solutions offer a range of benefits, including integrate diverse cabling standards, provide flexibility and scalability, reduce cable congestion and save space. Modular patch panel solutions allow the users to connect diverse network cabling standards seamlessly, such as 10/40/100/120G. When you need to integrate new cabling standards to support higher network speeds, you can simply swap existing cassettes with new cassettes that support the new standards. The network can grow and change on-demand, without the costly, labor-intensive hassle of replacing channels end-to-end. Moreover, reduced cable slack means less clutter, less confusion and an easily organized, better-labeled cabling infrastructure. By managing varying port densities and speeds in a single high-density patch panel, the users can save valuable rack space, helping to lower data center costs. Although the modular patch panels have many advantages, they also have challenges. The biggest challenge is selecting a modular patch panel solution with the features and capacity to meet your current needs, as well as flexibility and scalability to adapt to and grow with your future needs. With increasingly higher network speeds always just around the corner, you want to make sure your investment in upgrading and building out your network infrastructure is spent wisely. 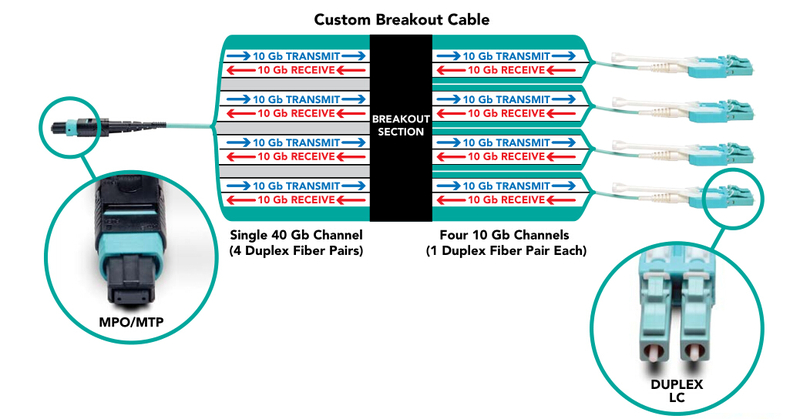 Breakout cabling solutions served an important purpose when 40G switches first entered the marketplace and required immediate connectivity solutions. However, they require end-to-end replacement every time you upgrade equipment. Modular patch panel solution has been a game-changer. 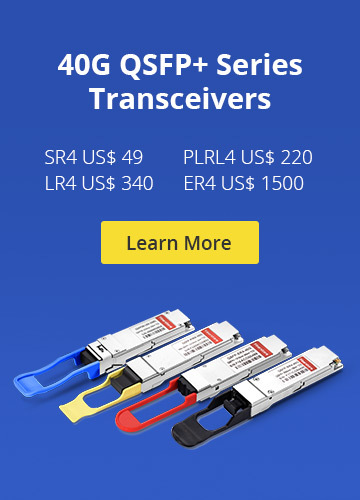 Designed for maximum connection density, flexibility, scalability and compatibility with both existing and emerging high-speed network standards, they allow users to seamlessly and conveniently integrate equipment with different network speeds to meet connectivity needs today, and cost-effectively future-proof network for tomorrow. Fiber Patch Panels, MTP/MPO Cable fiber cassette modules, modular patch panel vs. breakout cabling, patch panel. permalink. What Can High-density Fiber Patch Panel Achieve?